Barry Eugene Carter was born in 1944 in Galveston, Texas. Shortly after the family moved to a South Los Angeles neighborhood which was a high crime zone. His mother encouraged him with music and he taught himself to play piano. Barry made his recording debut at the tender age of 11, playing piano on Jesse Belvin's "Goodnight My Love." His first record was when he was 16. and the song was called “Little Girl” by the Upfronts. Young Barry could not help but hang out with local kids and got himself into trouble, by aged 17, had served time for stealing. Determined not to follow a life of crime he threw himself into music on release. He worked for various independent labels as an A&R man but Barry was also a talented song writer, soon making money writing for other artists including the Bobby Fuller Four (1966) and The Banana Splits. In 1963 Barry arranged Bob and Earl’s "Harlem Shuffle" for Bob & Earl, which became a hit in the UK in 1969. When the single was released it charted in the Top 20. Eventually Barry was encouraged to take the lead vocals, to which he reluctantly agreed. Barry’s first album, I've Got So Much To Give (1973), included the hit "I'm Gonna Love Ya Just a Little More, Baby." The Man with the velvet voice was backed by the Love Unlimited Orchestra, and the slickly produced soul songs signaled the beginning of the disco era. Barry’s studio band included guitarists Ray Parker, Jr., bassist Nathan East, Wah Wah Watson, David T. Walker, Dean Parks, Don Peake, bassist Wilton Felder of the Crusaders, Lee Ritenour, drummer Ed Greene, percussionist Gary Coleman, and later keyboardist Rahn Coleman. The Love Unlimited Orchestra was determined to record instrumentals, many thought this would be a disaster but “Love’s Theme” went straight into the pop charts on release silencing Barry’s critics. Throughout the seventies Barry White could not go wrong but by the '80s, his recording career had waned. In the 90s he did undergo a revival, thanks in part to appearances on the TV shows Ally McBeal and (his voice) in The Simpsons (Whacking Day). He was also offered the voice of South Park’s Chef, (indeed the part had been written for him), but his Christian beliefs conflicted with the program’s irreverent humor. So he refused. 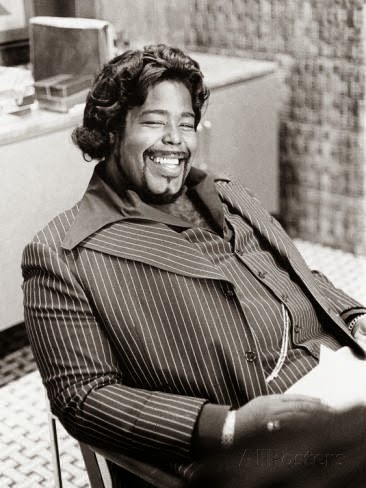 Barry stayed active touring and appearing on other artists' records including Quincy Jones' "The Secret Garden (The Seduction Suite)," Regina Belle, and rap star Big Daddy Kane's "All of Me." Barry suffered a stroke in 2003 which forced him to retire from public life. Chronic high blood pressure and renal failure eventually took their tool and Barry died in 2003, aged 58.